Looking for a speaker for your event? Hire Jayson for your event. Speaking is a real passion of mine. In my unique talks, I say what needs to be said but don't rave on endlessly for hours! What's true is that I've always got something to say to boost the morale and performance of your group or workplace. Inspiration and self improvement bring real change personally and professionally and financially. Curves Gym and the Gold Coast Social Business Networking Group to name just a few. One of my favorite places to speak is Melbourne's very own TRY Mentoring (formerly 'Big Brother Big Sister'). I've been a volunteer mentor and guest speaker for various events and volunteer intakes over the past 3 years. I've become friends with special 'Littles'. I think it's true to say we've changed each others' lives for the better. This is a really special and vital mentoring program for children who come from underprivileged families and just need a guide and a friend. I thoroughly enjoy it and highly recommend it to anyone who has a few spare hours or dollars to help out. A proportion of all JMC profits go to benefit these great people. 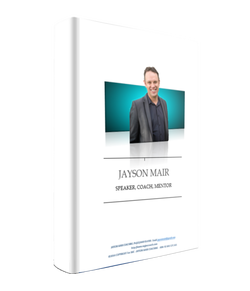 Contact Jayson to obtain a copy of his Speaker's Kit, click here. The Speaker's Kit details where he has spoken, some of the subjects that he has covered in his talks and how you can have him speak at your events. You may even be able to have a topic specifically put together for your group.